It was Sunday afternoon and we were gonna have lunch with noodle dish at Dong Khoi Street when we walked passing by this Vietnamese Restaurant, Ganh. 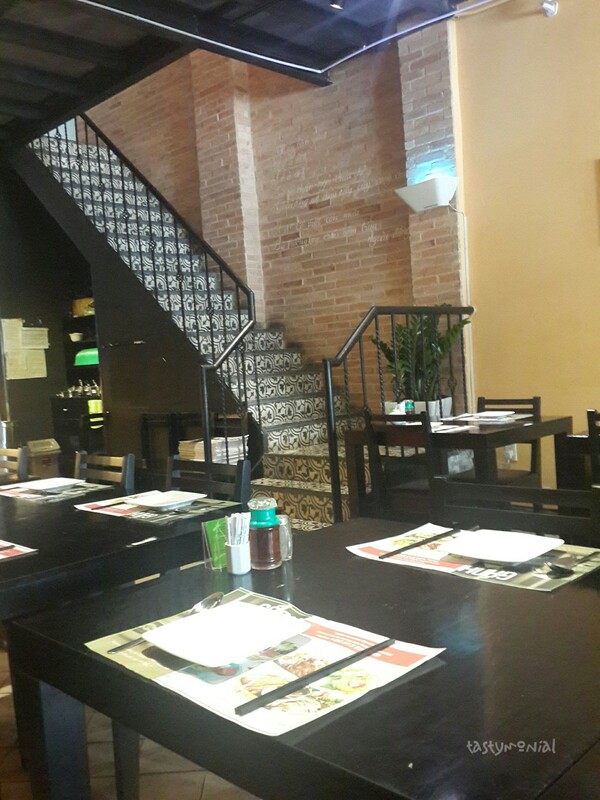 It is said that they serve Nha Trang Authentic Food. My husband have been to Nha Trang before and he wanted to find a good Nha Trang restaurant in Ho Chi Minh City. So we’ve been wanting to try Nha Trang cuisine and didn’t expect to found one at 91 Hai Ba Trung Street. The ambiance is really nice. I like the big painting on the wall. The waitress was very attentive. Once we sat down, they gave us the menu. We picked Nem Nuong Dac Biet (for share) and Bun Cha Gio (for me). They have Nem Nuong for one person as well. 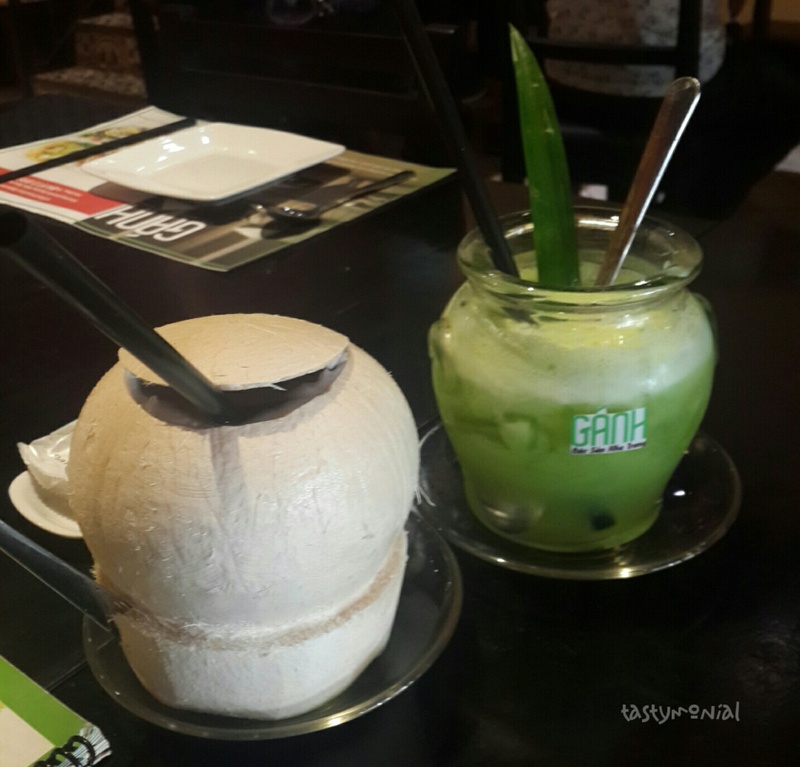 And for the drink, we ordered coconut and nuoc ep Ganh (Ganh special juice). Their menu has explanation in English, so it’s very easy for foreigner to order. Their Bun Cha Gio is good. I like the deep-fried rice paper pieces. It’s salty and crunchy. The cha gio (spring roll) also good surprisingly. It is different than cha gio in other restaurant, but still taste yummy. Nem Nuong Dac Biet came with a big plate of several items in it. 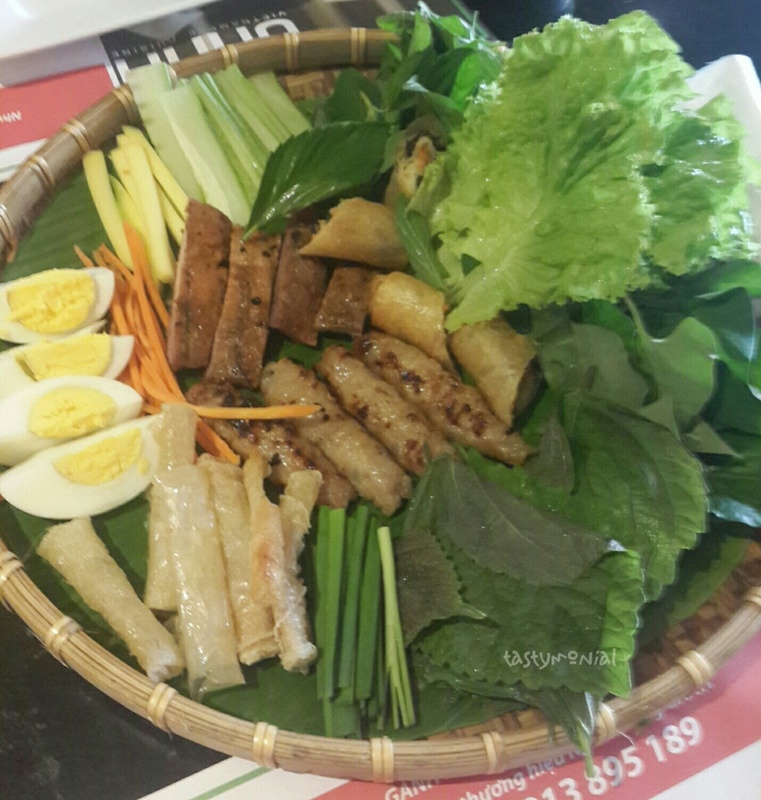 Rice papers, lettuces, several types of leaves, scallions, deep-fried rice papers, eggs, 2 kind of barbeque meat (savoury and sweet), carrots, mangos, and cucumbers. 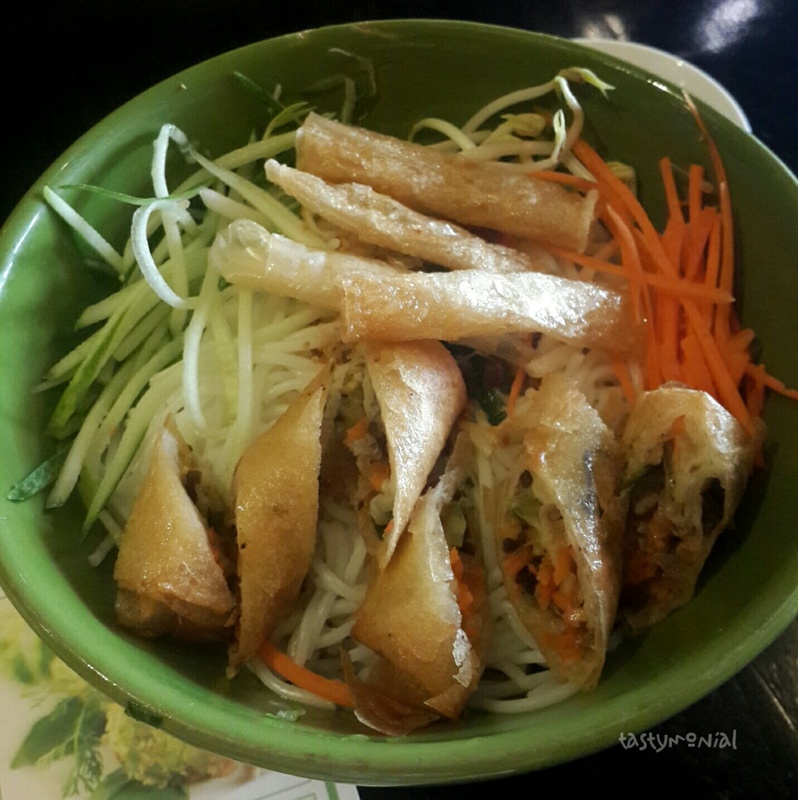 The rice paper used in nem nuong is different than the one used in fresh spring roll. This one has a square shape, and no need to rub it with water. It’s already soft, so you can use it directly. 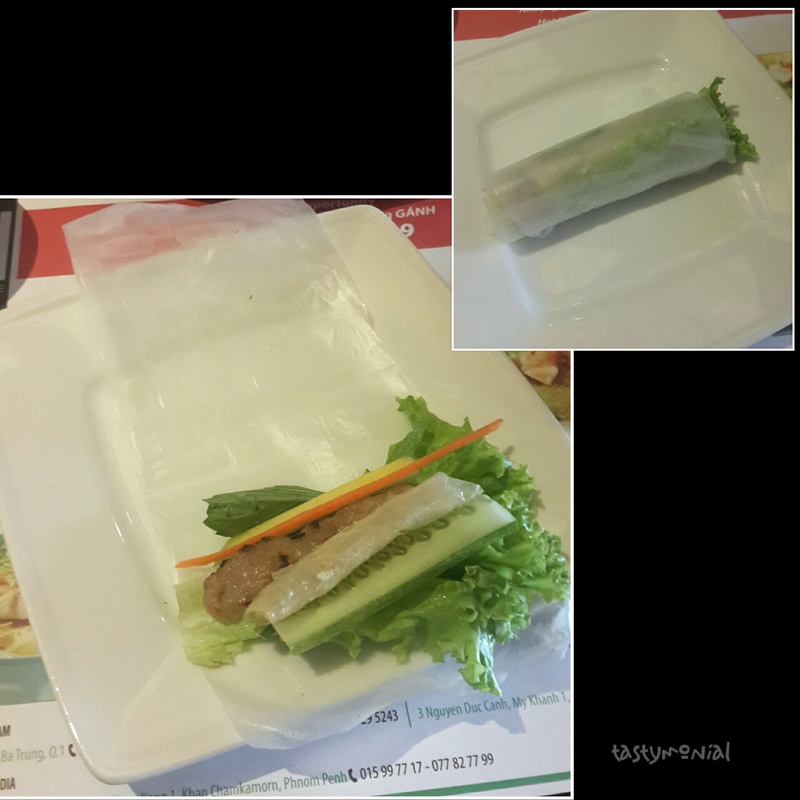 How to eat Nem Nuong : take 1 sheet of rice paper, put everything you want on top of it, roll the rice paper tightly, dip it in the sauce, and bon appetit. This one very delicious. I like to put mango inside. It tastes really fresh because of the sourness from mango (not that sour, don’t worry). Overall the foods were good, but the price is a bit high for Vietnamese food. It’s about 150.000 vnd (or USD $7) per person. But this one is recommended to try if you want to eat Nha Trang cuisine.